By day, an IT Business Architect/Product Manager, author, and conference speaker. By night (or rather, by vacation), a wanderlust-filled traveler seeking out new sights, new experiences. Who wants a desk job, really? Sure, there's security there, but look at all the world has to offer - the experience of stopping into a 1960's era roadside eatery and ordering a hot dog and french fries, sleeping in a hammock strung in a park pavilion in a town park overnight (with permission of the local police of course), and riding across a train trestle nearly 2/3-mile long that has been converted into a bicycle-only trail. I LIVE for this stuff. The sights one sees, the food one experiences, the people one meets - this is living life. Though I have been an ardent road-tripper over the years, and a backpacker since 1993, I recently started bike touring in 2010 with a 1-nighter from Easton, PA to Ocean City, NJ, a tour of about 130 miles. The irony is I wanted to cycle across the United States when I was a senior in High School, but work, university, and then family got in the way. It's only now that my children are out of high school and into university themselves I find the time to "sneak away" for a week to go on a tour by myself. Want to read more about my experiences? Here are a list of the bike tours I have ridden and journaled. If you like them, please leave me a comment and I'd love to hear from you - hope to see you on the road someday. 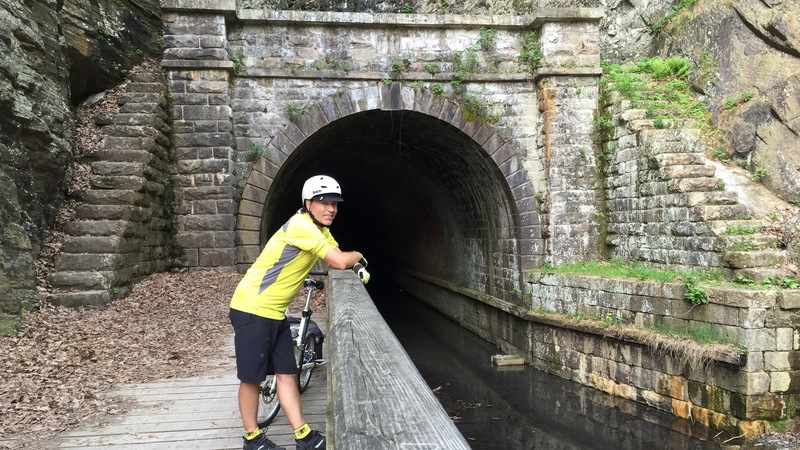 September 2018 - You CAN go home again - 6 days/378 miles riding from Syracuse to Philadelphia through NY and linking together rail trails and lesser-traveled roads. March 2018 - Silver Comet Express. 3-days from Birmingham, AL to Alpharetta, GA - riding home covering the entire Chief Ladiga/Silver Comet trails. September 2017 - Erie Canal eastbound, then north into Vermont. On Cycleblaze as 566 miles, 9 days, 1 iPhone. Also a featured ride report on RideWithGPS.com's site. March 2017 - Katy Trail. On CGOAB as Crossing MO on the Katy. September 2016 - GAP Trail and Washington DC. On Cycleblaze as Can I Join You? - this was fun because my wife joined me on her first tour. May 2015 - GAP and C&O end-to-end. On Cycleblaze as Living out of a Trailer. I really liked this tour and being on a 350+ mile bicycle trail. May 2014 - August, GA to Myrtle Beach, SC (almost). On CGOAB as Spinning Through the South. September 2012 - the first "full-on" tour of a week's worth of riding, from Boston, MA to Bar Harbor, ME. On CGOAB as Boston to Bar Harbor. If you feel that any of the journals were enjoyable, please give them a "like" and leave a comment - I do respond to all comments. And, I'd love to run into other tourers on the road - cheers!